Four favorite dinner plate dahlias in one easy collection. We have assembled four of our favorite dinner plate dahlias in one collection: Mom's Special (lavender), Taiheiyo (purple and white), Break Out (pale pink, yellow), and Maki (bright pink). Each plant produces huge flowers up to 8" wide on sturdy 3-4' upright plants that will be the showcase of your summer garden. 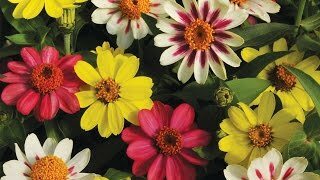 Beautiful as cut flowers, dinner plate dahlias are incredible specimen plants and blend well with your annuals or incorporated into perennial beds. Fewer flowers say “summer" like the bold blooms of dahlias.